Can you imagine for a moment logging into to your bank account and immediately feeling excitement and joy? I have to tell you that yes it can happen! Of course one obvious fix is watching that spending making sure you don’t over spend. Another way is to simplify how you manage your money. How you ask? Press play below and I’ll be sure to tell you! What is ONE way you have adapted that has simplified how you manage your money dramatically? Please be sure to share in the comments below! 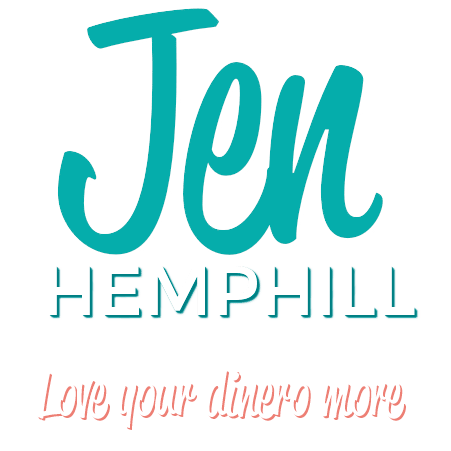 [00:00:26] JH: Hey there, this is Jen Hemphill. Thank you so much for tuning in to this podcast. I am coming to you from my normal spot of my home office. 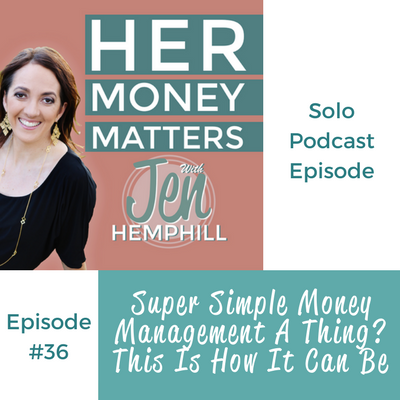 Today's episode we're going to talk about really simplifying how we manage our money. Managing money, if you think about it, is not just having that budget, that spreadsheet or that app, or just paying the bills, or just tracking your money. But rather is a combination of those things to help make that money flow smoothly. And I want you to imagine for a moment that month after month you're logging into a bank account, your bank account whether via your computer or via your smart phone and when you're logging in it gives you, you have this moment of joy rather than overwhelm, rather than stressing out. Think about that, wouldn't that be just such a fabulous feeling to have? Because you can have that. If you're currently logging into your bank account or looking at your bank account via your smartphone and that freaks you out and that overwhelms, you can change that. 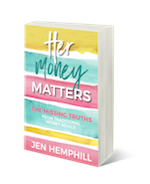 And you can change that, one way you can change it not just by simplifying your, how you manage your money, but it is one way that will help you change that feeling of overwhelm. So you can log in and have that feeling of joy, be elated, be excited to take a look at your money, cause that's what you want to do. That is really one of the goals you want to have is not just about saving the money and reaching these financial goals, but it's also about looking at your money and being excited about it and being enthused about it. That is a huge thing to accomplish. So in today's episode I am going to share with you my six tips to help you simplify how you manage your money. I'm also going to share with you what you should know when choosing a system to manage your money and it's something that we don't think about. I'm also going to share with you the real reason that you're not fully automating your money. And I'm going to share with you three handy ways how setting up banking alerts nowadays can simplify your life. Before we get into that, I want to tell you about someone. I want to give a shout out to one of our listeners in Canada, her name is Heather. She sent this email recently sharing how she has downloaded the Mini-guide, how she's been tracking her spending, so way to go Heather. And how she really, really loved - the part of the Mini-guide that she really loved was how I shared the percent of allocations and the different areas we spent on. So she mentioned how she just loved having this as a guide as to how she's doing in the different areas. So thank you so much Heather for writing in. I appreciate those sweet words you wrote. Keep pressing forward, you're doing great. Now for all the stuff that I promised you that I was going to share. So here are my six tips to help you really make your life easier in managing your finances. The first tip is to decide on a system that you're going to start using. Really that's also one of the first steps. And what do I mean by "system"? I'm talking about if it's a cash, all cash system, which chances are it's not going to necessarily be all cash if you're paying bills online. Or whether your system's going to be an all virtual system, maybe it's a combination of the both. Maybe you're using an app that you're loving, whether it's Mint or one of those apps like that. You've just got to be able to choose a system and start implementing it, okay? So one thing that we forget about that we don't think about, that it's okay to change it is not start using the system and if you're not liking it, stick to it. No! Give it a trial run, if you're not liking it there's other ways of doing it. There's whether maybe you're just using the cash system, maybe you're not liking the cash envelope system, it's okay! You can do other things. There's different ways of doing this. This is way, as I always mention, personal finance is personal. It's different to every person. So don't forget that. Choose a system, give it a trial run, if you don't like it, it's okay. There's other ways to go about it. Alright? The second tip I have for you is set up consistent dates to sit down and work through your finances. Really an easy, a super easy way to do this is to look at the dates that you're getting paid, or if you're an entrepreneur, use the date that you pay yourself. So use these dates as the week or the weekend that you're going to schedule those times to work through the bills. And keep it consistent, put it in your calendar, set up a reminder, and stick to it. You don't have to sit there for hours and hours, and I'm going to share with you some other things that is going to help you minimize the time that you sit down, okay? So just keep that in mind. The third tip that I have for you is to set up multiple accounts and the accounts that I really recommend are one, just solely for paying your bills. The second account that I recommend is one for your daily spending, and that is the only one you would want to have the debit card, okay? And then the third account I recommend is the emergency savings, and of course you can have a fourth account for another savings account. And the reason why I do this is it helps you get a clearer picture seeing how the money is flowing. So with your account that is solely for your bills, your main income is going to go there. Then your bills are going to get paid, you're also going to transfer some money to your daily spending, which includes your groceries, your gas money, those things that you need more frequently. So that way if you go to Target because it always happens at Target for me, and you go for certain things and you tend to overspend like I did today, you're not touching that money that's supposed to be going for bills. It's untouchable, you didn't miss with that bill that's supposed to be getting paid the following day, alright? So that's why it just makes life so much easier, it simplifies your money management just having those things separate. So I suggest three accounts, maybe four? But just keep it simple with those. The fourth tip that I have for you is to automate everything that you possibly can. Maybe you've already automated some bills, but maybe there's some bills that you just for some reason are not automating. Automating is going to save you so much time, especially when that couple times a month or that once a month that you consistently sit through to work on those bills, that's one less thing to handle. You just kind of check it off because it's automated and you know it's done, okay? If for some reason there's some things you're not automating, I'm going to get real with you it's fear okay? And the reason it's fear is because if you ask yourself, ask yourself this question. If there's something that you could be automating but you're holding back on, ask yourself if you're clear on where your money is going? Chances are there's some still blurry spots. So I'm keeping it real, that really is 90% or 99% of the time why you're not automating your finances, or maybe you don't like the company you're paying. Who knows? But I wanted to make sure that you are aware of that. If you're not automating it, it's going to save so much time. And if you're not automating it it could be you're not clear on where that money is going. The fifth tip that I have for you is to set up alerts with your bank. Banking has evolved so much that you can set up all sorts of alerts. So check with your bank to see what exactly they have available for you. So these alerts come in the form of texts, so you also have to keep in mind what kind of texting plan you have and they also come in via emails. So this is going to help you save and simplify your money or how much time you spend on your money. It's going to also help you keep track of your money because the three things that will just make, it will help you - three alerts that will help you with your money in specific, there's other alerts, but three of the primary ones that I think that are huge is you can set up an alert to notify you when a balance is above or below the amount that you specify. So that's really handy in knowing especially if you have a text come in and saying, "Hey, your balance is below X amount of money." And you can say woah, you weren't expecting that and you can go ahead and check what's going on versus waiting till you set through that designated time that you sit through to look through your money and find that you over-drafted. Okay? So also, another alert that is really handy to have is when there's been a deposit, when a check posts to your account, or on the other hand when a withdrawal is made, especially if it's a large one. So that's also good to know, especially if you know, if maybe a withdrawal was made and you didn't plan that. Maybe there was a miscommunication between you and your spouse. Whatever the case may be. So it's just handy to know, especially if you weren't expecting that. Or if you were expecting it, so you know it happened. And the third alert that I think is handy to have is when there's suspicious or unusual activity. This has happened to me recently where my card, my particular debit card was used fraudulently at a grocery store. And I think it was just hours later. I had gone in to just pick up some things and I actually use the self-checkout lane and I think that's where it's happened. And so a few hours later, I don’t know? It might have been even less than that. But it wasn't too much longer than I had left the store. I got a text from the bank asking, had I made these transactions? Had I made these purchases? And these purchases were in Texas, and I was nowhere near Texas. So that's just really nice to have. Also just in case there's fraudulent activity, we have to be cautious and we have to really make sure that those things aren't happening to us. And if it does, it's good to know right away so we can take action. If you're using credit cards they also have some really handy alerts. Of course, just check with your specific credit card. I know mine will email me a snapshot of like, "Okay, here at this time of the month this is how much you've charged on the card." Or, "Hello, this purchase was made and the credit card wasn't present." For example, in the case of an online purchase. Or what's also handy is if you've made a purchase and you returned it, it'll send you an alert saying, "Hey, such and such store refunded your money." So that's also nice to have. The sixth tip that I have for you is to do weekly brief checkins and I'm just saying "brief". It's just where you sit down, it could be in the evening time, whenever, and just take a look. Just scan over, go down through all the transactions, make sure that everything is looking okay. So those are my six tips. Now you know that I'm always looking out for you, so I created something just for you that will help you even further in managing your money, in making sure things are simple for you. My Money Insider sheet will not only help keep your bills straight, it reminds you to think ahead about what is coming up in terms of non-monthly bills so you can plan ahead and write down how much is needed for that next month for that particular bill. It also helps you just keep your current balance in mind, and not just so you know the balance, but I think it helps you in terms of abundance. Even if maybe it's $50 or whatever the case may be, but it helps you in being just grateful that there is money there, okay? Even if it's not what you want it to be necessarily, but it's just good to know your balance. And it will also help you keep track of how you're doing with your financial goals, cause I have a spot where you can write what your financial goals and where you're at currently. And it has an area to celebrate your wins. I am huge about celebrating wins, cause this is an area that we fall short on. So it's going to help you stretch your mind, it's really going to challenge you to stretch your mind, to think about what your wins are, or what your wins were for that week. And this in turn will help you keep up beat because if you find something that you did great no matter how big or small it may be, that's going to help you be up beat about your money and keep you motivated. I think that is huge. So make sure you grab that at Jenhemphill.com/sheet. That's all you have to type in to grab your Money Insider sheet and download it. So that is it. So here are the, just a quick recap of what we talked about in today's episode. I gave you my six tips to help you simplify how you manage your money. I shared with you one thing that you should keep in mind that we forget about when choosing a system to manage your money. And I keep it real with you and I share with you the real reason why you are not fully automating your money. And I also talk to you about three handy ways that banking alerts help you in simplifying your life and managing your money. So that is a wrap for today. Thank you so much for taking time to listen in to this podcast, and for your support. It's just been amazing. You can check out the show notes at Jenhemphill.com/36 and you can also get the Money Insider sheet there, or simply you can get it at Jenhemphill.com/sheet. So thank again for listening, and we'll catch you next Thursday.